PBS Food asks chef Susan Feniger, from Border Grill Restaurants, about her time with Julia Child on the show, “Cooking with Master Chefs.” In the midst of the Julia Child 100th Birthday Celebration, Feniger pays tribute to her legacy. What was it like working with Julia Child? Julia was absolutely dreamy. She was easy, she always made you feel extra comfortable, and always cared what we were doing. Were we teaching on TV? How our restaurants were? Julia was generous, knowledgeable, humble, funny , witty, wild, and loved life. She was truly someone I respected and thought inspired all, young and old, cooks or not cooks. She didn’t take herself too seriously, nor did she make cooking something just for chefs. She made cooking accessible for everyone. I absolutely adored her. What do you believe is Julia Child’s lasting legacy? Julia was a scholar in the truest sense. She respected the vast arena out there and never thought something was too simple to be thought of as “cuisine.” She opened the door to the now crazy TV world. She was the master of winning over an audience. Because of her warmth and generous soul, Julia will always be remembered as one of the greatest teachers of our time in many ways. What was the impact of appearing on Cooking with Master Chefs? Let me tell you how that was. We arrived at Mary Sue’s house at 5 am… Julia was right there with us, in front of her computer, nonstop. At lunch she’d break, have a beer and throw the ball to the dogs… having a blast with the true stars of the day. Then back to work, always encouraging us as she was busy typing it all in. Then when it was all done, about 7, it was off to her hotel, where we had cocktails, she’d invited someone to play piano during our cocktails. I think a friend and then off to Border Grill for dinner. At 11pm she was still ready to go, though we all were exhausted. Julia is truly a legend and I do not say that lightly. 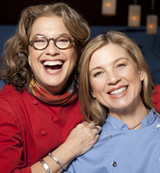 Susan Feniger, on left, divides her time between her first solo venture, Susan Feniger’s STREET, and the Border Grill restaurants in Santa Monica, Downtown LA, and Las Vegas at Mandalay Bay Resort & Casino, as well as the Border Grill Truck–all co-owned with Chef Mary Sue Milliken. A veteran of nearly 400 episodes of Food Network’s “Too Hot Tamales” and “Tamales World Tour” series along with Milliken, Feniger also co-authored five cookbooks including City Cuisine, Mesa Mexicana, and Cooking with Too Hot Tamales, as well as her new solo cookbook Susan Feniger’s Street Food.